Good Sunday! Today we have a new challenge at OSAAT. 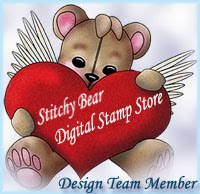 Please remember if you use an image available from any of the creators at StitchyBear Digi Outlet put a # after your name. So that we can find you... By using one of our stores images you are eligible to win our weekly top prize. For my card i used Digital image by Floppy Latte Designs "Darling Daises". For the sentiment i used rubber stamp by Heartfelt Creations, and Die Cut by Spellbinders. Thank you all for visiting me today. Oh it is very pretty my sweet friend! Beautiful card!Love your flowers,great coloring!!! The background is perfect with the flowers you colored which are gorgeous all that sparkle and the beautiful butterflies, the die cut with the sentiments and edged in that lovely color, its a stunning card. Thanks for sharing Miss Natalya and have a wonderful day..
Love your creation! Thank you for joining us at Crafty Calendar Challenge this month! Chocolate Crafts and Bears, Oh My! No Square and DT CALL!!!!!!!!! Empower Network Is a Scam? !